S'mores. They are the official junk food of summer! I went camping for the first time when I was 5 years old. I remember my parents building up the campfire, then sending me and my sister out to find some sticks for the marshmallows we were getting ready to roast. I had never had a s'more, but looking over the ingredients, I knew I couldn't wait to try them. I speared my marshmallow, held it over the flame, watched it get good and black (because I was told the more cooked the better), then blew out the fire excited for my first bite. The marshmallow looked so good, I didn't wait for the chocolate and graham to come my way. I immediately bit into the marshmallow. OMG, YUCK! It was crispy, tasted like ash, and literally made me sick. As soon as I swallowed that marshmallow, back up it came. Along with everything else I ate that day. Needless to say, that was my first and only time ever eating a roasted marshmallow. I have never had a real s'more that was cooked by the campfire because I just can't move past that one experience from almost 30 years ago. However, I do LOVE the graham, chocolate, marshmallow combo. I've found some pretty creative recipes over the years that still get me a s'more fix. Like my S'mores Popcorn Balls and these tasty S'mores Tarts! Preheat the oven to 350 degrees. Place pie crusts (keep in their foil pans) on a baking sheet. Bake for 6 minutes, or until lightly browned. Cool completely on a wire rack (about 30 minutes). In a medium saucepan, combine pudding mix and milk. Over medium-high heat, bring to a boil, stirring occasionally. Remove from heat, stir in vanilla. Increase oven temperature to broil. Spoon pudding evenly into prepared pie crusts, then sprinkle with chopped chocolate. Top each tart with 1 marshmallow. Broil tarts for 30 seconds, or until marshmallows are lightly toasted. Serve warm or at room temperature. I like my marshmallows nice and brown like that, not black!! Poor thing! What an awful first experience for u.
Hahahaha - that is EXACTLY why I don't roast marshmallows! The burnt taste does not not go well with the sweet. Ick. These sound amazing, though, and I definitely need to try them. SOON. I didn't like S'mores until just a couple of years ago. I still only like them w/a golden brown marshmallow. The black char is icky. The burnt taste is nasty indeed, but then I never was a huge fan of them to begin with. I have never eaten smores but those smores tarts certainly look delicious Theresa! Have a good Thursday. Omg, these look delicious! Sorry about your childhood marshmallow roasting experience, that sounds awful. My mom always ate the burst ones when I was a kid... Weirdly enough, she likes them. I like them black. They don't make me throw up. I understand what you are talking about though. There was one dish that Travis made when I was pregnant with one of the boys. It was an egg plant dish mixed with something sweet. I told him, "Never again!" It was the most disgusting combo I've ever tasted. I don't care if another culture loves the combo, or not. Alissa, there are so many things from my first pregnancy that made me sick that I refuse to try again. I remember working in the mall across from Bath and Body Works. The smell of that place made me sick every day and I have a hard time shopping there to this day! Papa Johns pizza too. Couldn't handle the stuff and still get queasy thinking about it! Nice pictures, that I love chocolate cake! Yum! Found this on Friendship Friday - looks so good! OMyGosh! Your marshmellow story was hilarious, even the barfing part. I can just imagine how that would happen because the ashy shell that comes off is yuck and the marshmallow is too gooey and gaggy. Oh you poor thing. Personally I don't like s'mores at all; the authentic kind, that is. I love to make them with those chocolate covered graham cracker cookies. You wrap two cookies with a marshmallow in between with alum foil and then place them in hot white coals for about 2 minutes. Undo the wrapper of foil and VOILA!!!! ONE PERFECT S'MORE, NO BURN, NO HALF MELTED CRAPPY CHOCO-BAR, BUT ONE PERFECT HOT AND GOOEY S'MORE!!! awh ~ heaven! and ...I will try your recipe, too. They look very GOOOOOOOD! I could eat blackened marshmallows all day long. 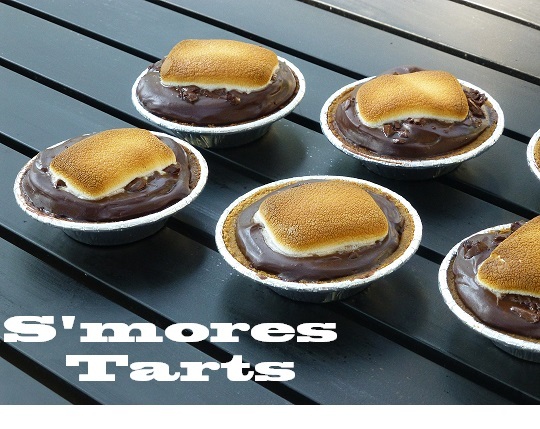 These S'mores Tarts look yummy. I'm printing out the recipe and am going to make them sometime soon.